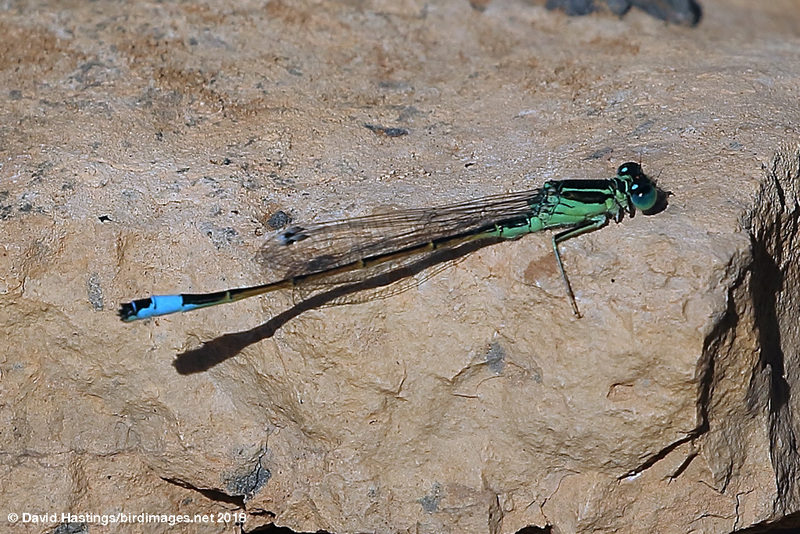 Saharan Blue-tailed Damselfly (Ischnura saharensis). Male. Taken at Los Molinos, Fuerteventura, on March 12th 2018. Approx 6.25x lifesize. Male. Taken at Los Molinos, Fuerteventura, on March 12th 2018. 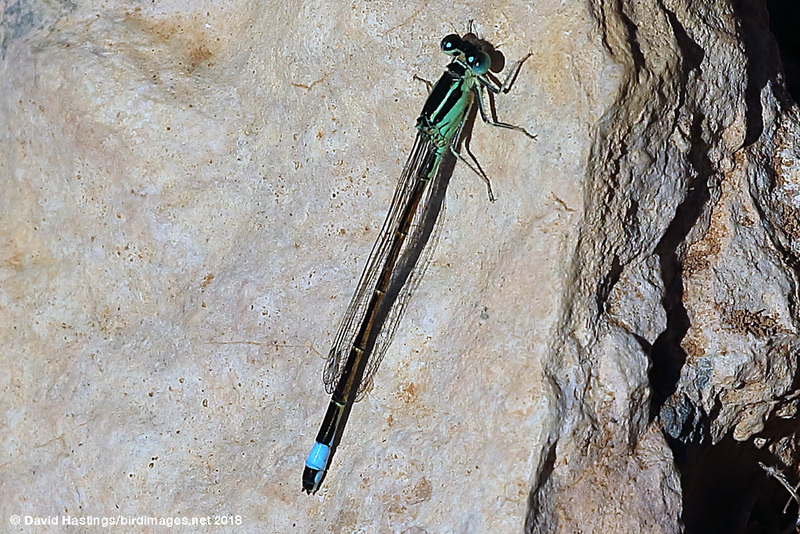 Saharan Blue-tailed Damselfly (Ischnura saharensis). Male. Taken at Los Molinos, Fuerteventura, on March 12th 2018. Approx 5.5x lifesize. 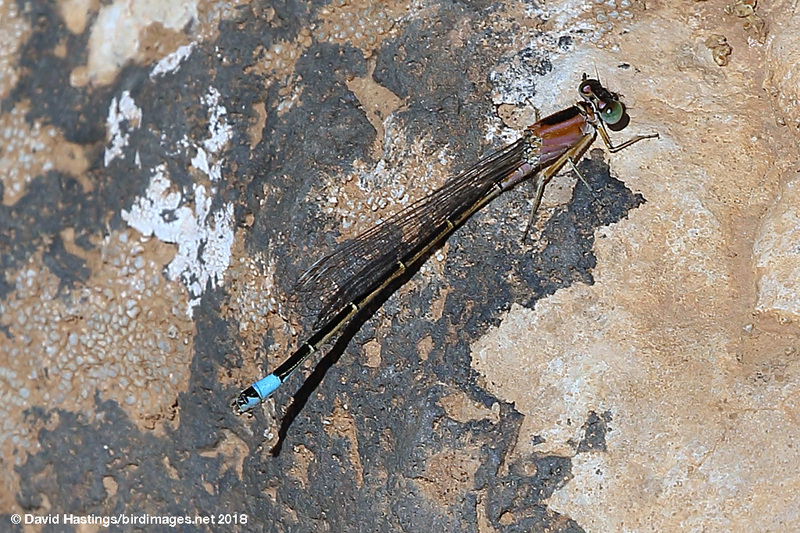 Saharan Blue-tailed Dalselfly (Ischnura saharensis). Immature female. Taken at Los Molinos, Fuerteventura, on March 12th 2018. Approx 5.5x lifesize. Immature female. Taken at Los Molinos, Fuerteventura, on March 12th 2018. This close relative of I. elegans is one of the smallest blue-tails. Mature males have a green head, thorax and abdomen base. Immature females usually have a pink thorax, but are green when mature. It is endemic to the western Sahara and the Canary Islands. It is found in running and standing waters, preferably with dense vegetation. There are several generations throughout the year, but activity is reduced from December to February. This species is widespread and locally abundant along the northern fringes of the Sahara. It is regarded as of Least Concern by the IUCN.